Car ownership, alongside television, meant that for most people the fifties were very different from previous decades. More people now had the freedom to go where they wanted, when they wanted and there was nothing third class about motoring. At first they had to make do with pre-war cars, as rationing and the drive for exports restricted the home market. Once rationing was finally over there was a boom in car ownership. The car and the booming British car industry was a symbol of the new prosperity. People had "never had it so good". Like the music of the 50s, the cars changed radically in the 50s. Early models were based on pre-war designs. 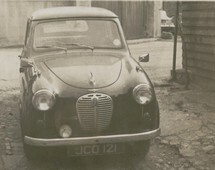 One of the first completely new cars was Alec Issigonis' Morris Minor. It was design he worked on during the war years. 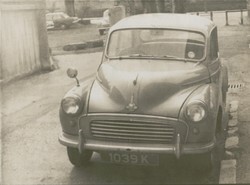 The Morris Minor had a rounded look which developed from the streamlined style of the late 30s. The original models had headlights low down in the grill and a split front windscreen screen. This example (left) is from the middle years of the 50s. The Morris Minor had a long production run, from 1948 to 1971, but by the end of its run, it was distinctly unfashionable. However, battered early models were often repainted in bright colours and used as transport by the hippie movement. It is still a very popular classic on today's roads and is affectionately known by some as a "Moggie"
Austin's rival to the Morris Minor was the Austin A30 (right). Like the Morris, it had the rounded look of the early fifties. It was a scaled down version of the larger Austin Somerset. In the second half of the fifties, British car designers took their lead from America. They adorned British cars with chrome and gave them rocket-inspired fins. It was on a much smaller scale than the excesses of the US, nevertheless British cars were brighter and more glamorous in the second half of the fifties. Ford's top of the range Zodiac had two-tone paint and its name spelt out in gold plated letters on the bonnet. Later the Zephyr, Consul and Zodiac acquired fins and a lower look following the style of the American Fords of the 50s. Vauxhall, strongly influenced by its parent company, General Motors, produced a car very similar to Chevrolets of the 50s, the Vauxhall Victor. The Victor brought all the excesses of the decade into one model. Its glamorous futuristic look failed to last, however, and the cars rusted badly and cost Vauxhall dear in terms of reputation. 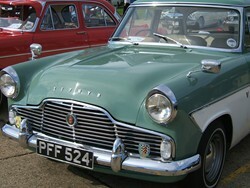 BMC (British Motor Corporation) also used two-tone paint on Morris Oxford and Austin Cambridge models. Fins were added in 1959 when Pinnin Farina restyled both models. The jukebox style of the fifties continued into the early years of the sixties. New models such as the Ford Classic continued the theme.